Continuing the Build Your Own Website discussion over at the SCBWI message board. We've already discussed WHO you're doing it for ... and we've had a look at the platforms; AND we've talked about blogging ... or not. Now you've got your blog/website, how do you design it so people do what you want them to do? When you come upon a new website, how many seconds do you hang around before moving to another site? Why do you stay? Web guru Seth Godin says (and I paraphrase) people on web pages are like monkeys in search of bananas. If they find no bananas, they don't hang around. They just leave. Check out the design of one of the internet's most successful start-ups, Amazon. The biggest banana of course is the book cover (yeah, why not sneak in a plug about Tall Story, while I'm at it?). But Amazon makes sure to put a bright yellow button on the top right to make it absolutely clear what you should do about the big banana. The banana is that blue box with the bright yellow button. Amazon wants you to buy this book. So do I. The thing is, most people will discover your website accidentally. So you want to make sure that when they get there, they know what to do. Don't give them a chance to get bored. And another thing: make sure the bananas are on EVERY PAGE of your website. A lot of newbies think they only need to load their bananas on the front page of their website. Well, I've got news for you. On the internet, there is no front page. Remember the hyper in hyperlink? Hyperlinking means that a punter could arrive at any page of your webstie while wandering around Google. Which means every page of your website is a landing page. This is why most blogs and web-builders provide sidebar elements that appear on every single page of your site. The next time you are playing around with your blog and considering whether to add that cool new blinking bat widget to the sidebar - think hard about bananas. But do you know what your bananas are? 3 Read my blog (and love me). 4 Read about me (and love me). 12 Buy my book (wait ... I've already said that). Well it looks busy, but there is method to my madness. I wanted it to look friendly and funny. A busy looking site exudes a different feel to an orderly site with lots of white space. I wanted to make visitors feel like they were looking through my scrapbook. I am not a glamorous person so my portraits are informal and stolen (NOTE: I don't mean stolen as in stealing pictures on line, i mean "not posed" or formal). An aside: when I am designing a website for an author, I always ask what they see themselves writing in a few years time. A website has got to be sustainable! 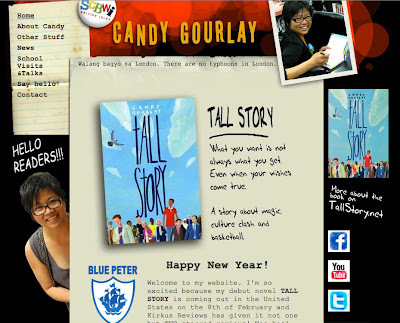 1st Banana - My book - click on the image and you end up on the Tall Story website. Banana 2 also brings you to the Tall Story website. I'm trying to sell my book - but I didn't think people would want to go straight to Amazon ...I thought I'd lead them to a bit more information first. Banana 3 goes to my social media profiles (Facebook, YouTube and Twitter). Why? Studying my stats, I've noticed that most traffic going to my websites and blogs come from Twitter and Facebook. I'm thinking of dropping the YouTube link because I don't spend that much time interacting with other YouTubers. Of course having said all that about bananas, one must exercise great care in applying bananas to one's site. Too many bananas may have the opposite effect of driving traffic away. Hey, just had a quick look, have starred it so I can read more closely. Thanks for these posts....lurve the banana pile!! Thanks Deb - had to change the banana pile as it turned out not to be on Creative Commons ... but the shifty monkey eyes look just as great! Oh man...LOLOLOL!! 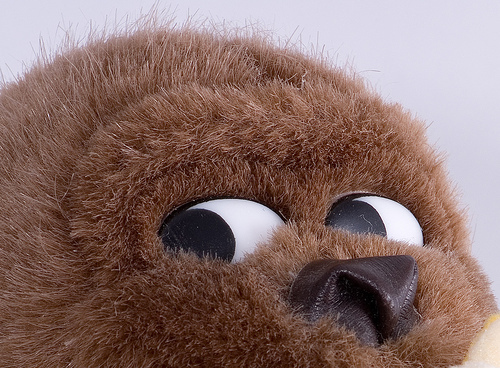 Shifty monkey eyes do look great! I love bananas (especially in oatmeal) and Seth Godin, he is the guru of marketing, if people haven't discovered him I'd encourage them to listen to a radio interview with him or read one of his books. I love the sustainability part as we will all go on to write more books and perhaps in different genres. Will be looking to strategically place bananas as I re-design my site. This is such a useful, clear post, Candy. Thank you for sharing some of your web design insights! 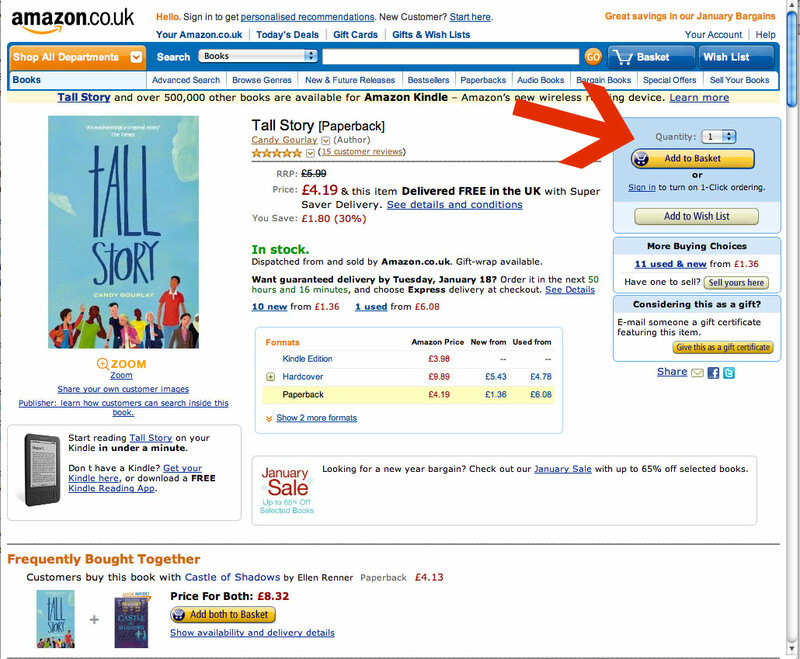 Well, my main banana on the tallstory.net site does lead to amazon ... but I do have links to the book depository as well - amazon invented the model which makes it easier for us authors to sell our books. some authors who do not want to support amazon, promote independent bookshops on their websites instead. The best thing about linking to Amazon is when there's a 'look inside' option and useful reviews. Yes, i don't think we can ignore Amazon despite all the things that come with ... but we can also link to other online shops. i'm trying to think of a nice way of doing this without having a horrible bunch of links on the sidebar. and if only indie bookshops have one portal we could link to so that people can shop at their local bookshop online! indie bookshops in the UK. if anyone knows something about this, do post here! How do you like them apples? Erm, I mean bananas. Or can I have kiwi fruit instead - those would be for my slightly stranger visitors. In terms of indie booksellers, abebooks.co.uk is more independently minded than Amazon, although both sites share many of the same marketplace sellers. This is a very thoughtful and thought inducing article. You (and Seth) have really hit the nail on the head. 'Traditional' and rather static websites, just don't seem to cut the mustard these days. 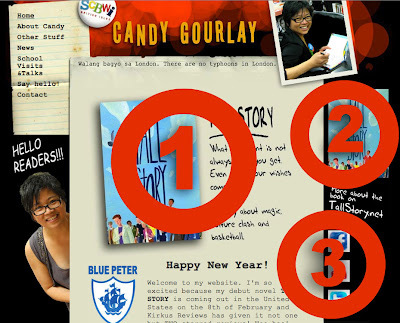 The blog format, with sidebars (and bananas! ), is so much more vital, far better suited to our business and audience. People really want fresh content and interaction. I have both and analysing traffic and responses, it's clear what works. At the risk of using up too much space, can I show you my sites, which illustrate this well I think. Paul Stickland website static, tricky to update, bit boring, few bananas and recently hacked. much more fun, frequent, fruity and simple updates, integration with twitter etc. and lots more hits! Clearly much of this is aimed at sending traffic to my Zazzle stores, which it does and not concentrating on my books. I've been using wordpress for another project and am now going to redo my main site! Thanks Candy, for a great article. Oops, sorry about that! 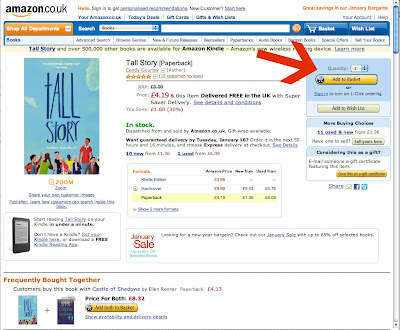 And of course, so many people use Amazon and it's so friendly to authors and book buyers. But glad to see you've included the Book Depository as an option as well--and also pointed out that it ships free to numerous countries. Too bad the UK doesn't have an option like Indie Bound. I have seen some authors give the link to their local bookstore, which can provide signed books. thanks for that paul - it's true that blogs and social profiles are much more traffic friendly, but i think there are many things an author can do to make their more static author website or book microsite work harder. i try to drive traffic to my social profiles and the other way around - but it's important to realize that it's not just about moving traffic, THERE HAS TO BE GOOD STUFF there for people to find. the more static sites are about serving your audience, the social media is about building them. @anne i'm trying to design a set of online links to online bookstores (Amazon, Book Depositor, Waterstones, etc) - i could post the html on the blog and then (UK) authors can copy and just insert the url to their books. if only the indie people got their websites up to scratch and compiled on a page i could craete a link to 'find your local independent". Brilliant article, raising many good points, but ...although I know you meant this bit with tongue in cheek, I have to ask you to explain to people NOT TO STEAL images they find on the web to use on their site. "I am not a glamorous person so my pictures are informal and stolen." Please don't say things like this making it seem okay! I know of Illustrators spending precious time chasing up stolen images on other sites where they are actually being sold on items or licensed by another individual. And it is often a case where exposing the abuser on the creator’s site has brought the abuser's site down and their reputation is shredded - all via the www. Prosecution is tricky, but shame can be powerful, so please 'think' before you use another person's copyrighted image, and obtain permission when necessary. A Google image search that brings up images doesn't mean you can use them freely - many are copyright protected, but some may be free to use. There are plenty of images out there that CAN be used, so there is no need to steal for your website content. Sorry this seems like a rant. Image theft is something I care strongly about. i'm planning to do a separate blog on images - but what i meant by informal and stolen was that my portrait shots are more like stolen shots, not posed. it was more a comment on personality of the site than on obtaining images. sorry for the misunderstanding! will put a note on it. Top Bananas, Candy! I'm off to put even more Amazon bananas on my website! Really helpful Candy! Thank you! I keep humming bananas in pyjamas - no, that's something else. Great post - I am finding this set of articles very user-friendly. So basically the message we should all be aiming for is - buy my book, love me and I'll give you a banana. Did I get that right? Thanks for editing to explain what you meant by using 'stolen' images. It is much clearer now you have changed the wording. I appreciate your clarification. Was:"I am not a glamorous person so my pictures are informal and stolen." Now:I am not a glamorous person so my portraits are informal and stolen (NOTE: I don't mean stolen as in stealing pictures on line, I mean "not posed" or formal). It's true, making your page easy to navigate is always a good idea. Every page in your website is a landing page, provided that users do find your site using keywords rather than your website's page. Thanks for posting the tips on building one's own website. You can also acquire the help of Web designers to develop your page. Great journal website.. i'll be genuinely astonished so you accomplish an excellent appreciative work.. thanks for expressing... i prefer to look at that subject. please state some factor extra... Appreciate it. Thanks for sharing these useful tips regarding website design. The way you explained Website designing in this blog, is fantastic. When you are going to design, website, have to ensure about website logo, navigation and images. Because these are things that helps to brings traffic on website. So many website designing institute provides coaching on these effective concepts.